In early spring there were several enchanted afternoons for SOUTH PACIFIC devotees. This year marks a half century since the film version of SOUTH PACIFIC burst onto the screen, starring Mitzi Gaynor, Rossano Brazzi, and the glorious Hawaiian island of Kauai (standing in for Bali Ha'i and the South Pacific). 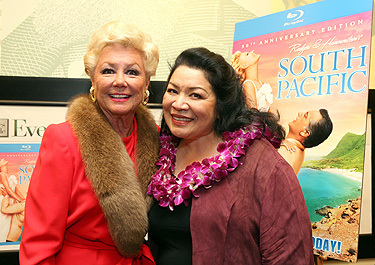 On March 31, Twentieth Century Fox Home Entertainment released the first Blu-ray edition of SOUTH PACIFIC (also noteworthy as the first Blu-ray edition of an R&H movie musical title), and helping in the hoopla was herself—Mitzi Gaynor. The radiant Mitzi came to New York to do a round of national media and television press, followed by her exclusive public appearance: a Blu-ray signing at Barnes & Noble near Lincoln Center. The room held up to 250 spectators, but close to 280 crowded in, with another 150 or so outside the doors, eager to hear every word from Hollywood's Nellie Forbush. The crowd loved every minute of it, especially an extraordinary—and hairs-standing-on-the-back-of-your-neck—moment: as she described the final scene of SOUTH PACIFIC, and Nellie's love for the children, Mitzi Gaynor began to replay the scene in great detail...and half a century dropped away as she became Nellie...And then, as she reached out to BarBara Luna and the De Leon brothers, they responded almost sub-conciously as the characters they had played sixty years ago. SOUTH PACIFIC on Broadway '49 and on screen '58, meeting together on a New York spring afternoon in 2009. Everyone was nearly in tears by the time another surprise guest, Tony Award nominee Loretta Ables Sayre, sang her lovely rendition of "Happy Talk." Tears, now for real—and cheers. "If you don't have a dream/How you gonna have a dream come true?" There were more tears—tears of joy, and tears of reflection—the next day, April 1. On that historic day, 13 important veterans came to see the matinee of SOUTH PACIFIC at Lincoln Center Theater. They included six performers who had appeared in SOUTH PACIFIC on its opening night 60 years ago—April 7, 1949…Another six who had appeared in the Broadway company between 1949 and 1954…and one stalwart from the legendary US National Tour, Iva Withers who played Nellie Forbush during the run. They loved the performance, swept up in music and memories. At the curtain call, this production's Luther Billis (Danny Burstein) stepped forward to give a curtain speech. He told the audience that the original production of SOUTH PACIFIC would turn sixty the following week; the audience "ooohed." He told them that Mary Rodgers and Alice Hammerstein, the daughters of the composer and lyricist respectively, were in attendance. Now the audience "aahed." He told them about the 13 veterans also in attendance; the audience broke into applause—until Danny said, "We'd like to introduce them to you now." And then, theatrical history and theatrical magic happened: select actors on stage stepped forward to name their original production equivalents sitting in the audience. Sea Bees introduced Sea Bees; Nurses welcomed Nurses; and finally, Laura Osnes, this production's current Nellie Forbush, welcomed Iva Withers. The audience cheered. The actors on stage cheered. The ushers, musicians and stage hands cheered. Sixty years came rushing together in a gigantic beautiful swirl and it was an enchanted moment none who were there will ever forget. SOUTH PACIFIC is now in its second year at Lincoln Center Theater's Vivian Beaumont Theater; visit www.lct.org for more information. 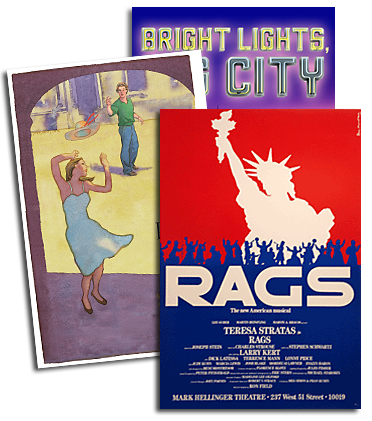 A commemorative songbook and cast recording CD are also available. The South Pacific Companion is now available from Simon & Schuster, and the Blu-ray of SOUTH PACIFIC starring Mitzi Gaynor and Rossano Brazzi is available from Twentieth Century Fox Home Entertainment. NOTE: Shirley Jones was born in Charleroi, Pennsylvania on March 31, 1934…OKLAHOMA! opened at the St. James Theater on Broadway, March 31, 1943...and CINDERELLA starring Julie Andrews was broadcast live on CBS-TV on March 31, 1957.